In the Rig-Veda, the Sarasvati is both a goddess and a river—a “mighty” river “flowing from the mountain to the sea”, and the only one to be deified in the Vedic hymns. In the late Vedic era, it broke up and was reduced to a small seasonal stream—the only major river to suffer this fate in northwest India. 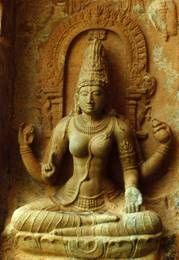 At the same time, Sarasvati, the goddess of speech, knowledge and the arts, grew in stature and became in many ways the fountainhead of India’s classical civilization. But there is another side to the story, which began with the rediscovery of the river’s dry bed in the nineteenth century: later, archaeological explorations initiated by Marc Aurel Stein eventually unearthed hundreds of Harappan sites in the Sarasvati’s basin. As it turned out, the lost river has provided an unexpected bridge between the Vedic world and the Indus-Sarasvati civilization, calling for a fresh look at old models. French-born Michel Danino has been living in India since 1977. A long-time student of India’s protohistory, he authored in 1996 The Invasion That Never Was, a first study of the Aryan problem. He has given numerous lectures in cultural and educational institutions all over India about the Indus-Sarasvati civilization, the Aryan problem, India’s scientific and ecological heritage, India’s contributions to world culture, and challenges faced by Indian culture today. He has in particular contributed original research on the mathematics of Harappan town-planning (with a focus on Dholavira), with significant results in the field of metrology. In 2006, Michel Danino’s study of the Aryan problem gave rise to a French book, due to be published in an English adaptation. His latest works are The Lost River: On the Trail of the Sarasvati (Penguin Books India, 2010) and Indian Culture and India’s Future (DK Printworld, 2011). Tamil translation of his book The Lost River: On the Trail of the Sarasvati, published by New Horizon Media Private Limited will be released in September 2011.